Recent sightings of Take Jack include premiere concerts of CRAZY COLD BEAUTIFUL in Grand Marais and Duluth and a gig at Papa Charlie’s in Lutsen – all in Minnesota, a two-night Cycle of Life gig with Phil Lesh and Friends at Terrapin Crossroads in San Rafael, a 3-night run at the Chautauqua Revue at the Arts and Ecology Center in Occidental, concerts at; The Sebastopol Community Cultural Center Annex, The Sacramento Poetry Center, Main Stage West in Sebastopol, The Monkey House in Berkeley, The Forte House in San Francisco, The Journey Center in Santa Rosa, Point Reyes Dance Palace, Tsakopoulos Library Galleria in Sacramento, the Caves at Favero Vineyards in Sonoma Valley, the Marin Rod and Gun Club, Twin Oaks Tavern in Penngrove, Cinnabar Theater in Petaluma, the Arlene Francis Center in Santa Rosa, Laguna Foundation’s Heron Hall in Santa Rosa, Congregation Shomrei Torah – fundraiser for their social action committee, The Spotlight Theater in Bakersfield, and The Magpie Festival in Sierraville. 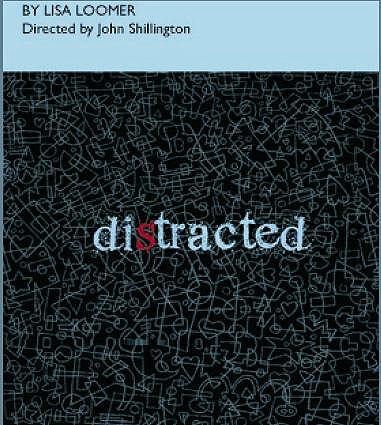 Take Jack has composed and performed pre-show music for 4 theater productions directed by John Shillington at the Santa Rosa Junior College. These include Jesus Christ Superstar, Our Town, Distracted, and Almost Maine. UPCOMING: October concerts in Santa Rosa and Berkeley. December in Cobb Mountain. January 2017 – Cinnabar Theater in Petaluma. CRAZY COLD BEAUTIFUL • the John Beargrease Song Cycle. WEST COAST PREMIERE. March 19. 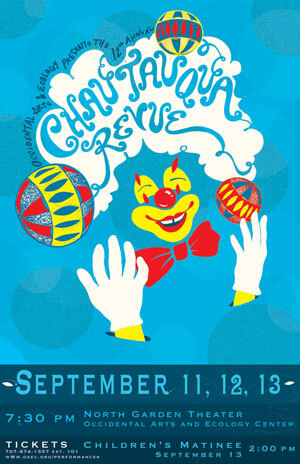 3:00 PM and 8:00 PM, Glaser Center, Santa Rosa. CRAZY COLD BEAUTIFUL is a song cycle about the history and culture of sled dog mushing in northern Minnesota. And, it’s more than that. It is inspired by 19th-century Ojibwe mail carrier John Beargrease and by the annual John Beargrease Sled Dog Marathon. For twenty years between 1879 and 1900, John Beargrease delivered mail in the winter months with his sled dogs, traveling 90 miles each way over some fiercely formidable terrain in slicing winter cold. He was a beloved member of the north shore community of Lake Superior, respected and admired equally by members of his native Ojibwe community and by the European immigrants–Norwegians, Swedes and Germans–who were beginning their new lives along the shore of magnificent Lake Superior. The song cycle includes stories about John Beargrease, settings of journal entries written during the twenty years he was delivering mail, excerpts from letters delivered to the area during that time, songs about the importance of the sled dog through the centuries for survival and companionship and the side-by-side of everyday life, songs about mushers and the John Beargrease Sled Dog Marathon that takes place annually following the route that JB traveled. It is a remarkable world filled with beauty and heartbreak and hope and snow and wind and people coming together to make it through. And cold. And the dogs at every turn. Take Jack just returned from premiere concerts in Minnesota with The Borealis Chorale and Orchestra, directed by William Beckstrand, where we could not have felt more welcomed by the people there who arrived in their many layers to hear us sing about their community. The response was fantastic. Now we will be joined by Sonoma County’s Kitchen Choir, directed by Sarah Saulsbury, for this west coast premiere. As well – orchestra, including Steve Adams, Cory Wright, Kyle Bruckman, John Tuttle, Oliver Tuttle, John Bidwell, Philip Beard, Sarah Jo Zaharako, Katie Harlow and Joseph Sabella. The whole occasion will be conducted by award-winning Bay Area composer, orchestral conductor, multi-instrumentalist, revered educator and stellar photographer, Omid Zoufonoun. We’ll be the ones with the new clothing! Thanks to all of you who have been following this project and supporting us along the way, here we go… here’s to the dogs! 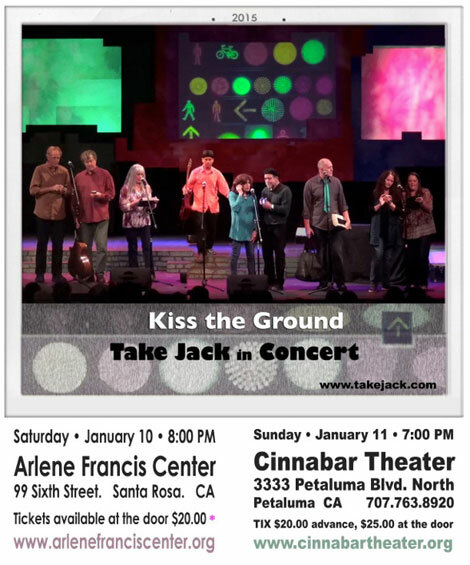 Take Jack is a nine-member collaborative ensemble of Sonoma County-based singers, composers, and musicians who charmed and inspired a sellout CST audience at last year’s Peace Concert. The January concert will feature songs about choices we all face in navigating the terrain of the day-to-day, along with selections from the Covered in Birds material written for the Laguna de Santa Rosa Foundation. 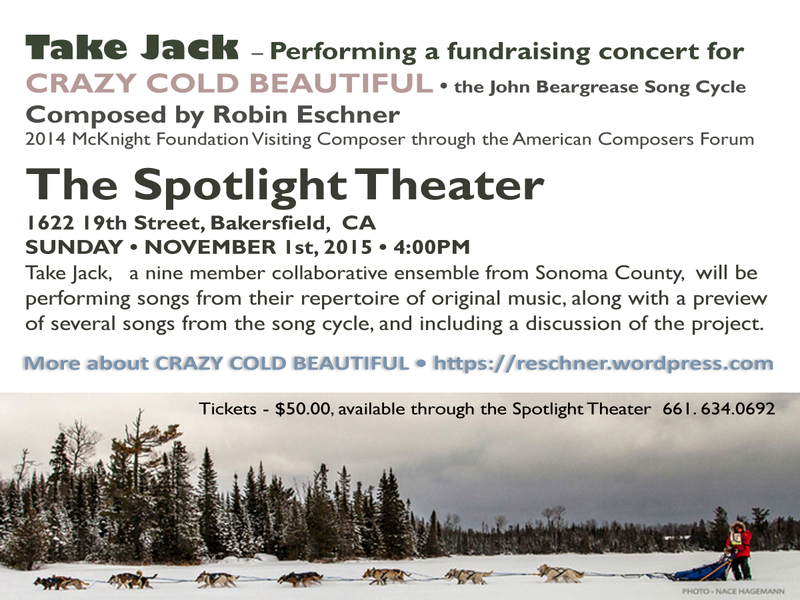 As well there will be a preview of a few songs from “CRAZY COLD BEAUTIFUL” – a new composition written by 2014 McKnight Foundation Visiting Composer through the American Composers Forum, Robin Eschner. This is a song cycle about the history and culture of sled dog mushing along the north shore area of Minnesota, as inspired by 19th century Anishinaabe mail carrier John Beargrease and influenced by the spirit of the annual John Beargrease Sled Dog Marathon. Take Jack will be traveling to Minnesota in early February 2016 for the premiere performances of this piece. 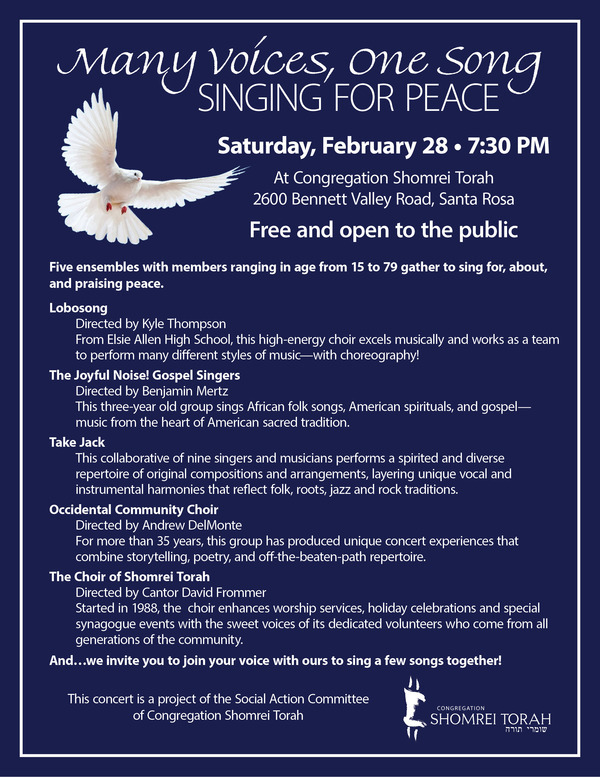 Seats may be purchased online at www.cstsr.org and through the Congregation Shomrei Torah office, 578-5519. Seats are $12 if purchased in advance and $15 at the door. This concert is a fundraiser to support the work of the CST Social Action Committee. The Social Action Committee, SAC, reaches out to the broader Sonoma County community with programs for the homeless and needy including providing food to around 10,000 individuals yearly thru Elisha’s Pantry , providing warm winter clothing and Holiday toys and championing more low cost housing, fare wage legislation, and immigrant rights. Ongoing work also includes programing that promotes dialogue and understanding within the County’s diverse population. SACs nationally recognized film series, Social Action Goes to The Movies, is focusing this year on Mental Health issues including suicide in all age groups. One cold, clear Friday night in the middle of winter, northern lights in the sky above, the residents of this small town find themselves falling in and out of love in the strangest ways. Knees are bruised. Hearts are broken. Love is lost, found, and confounded. 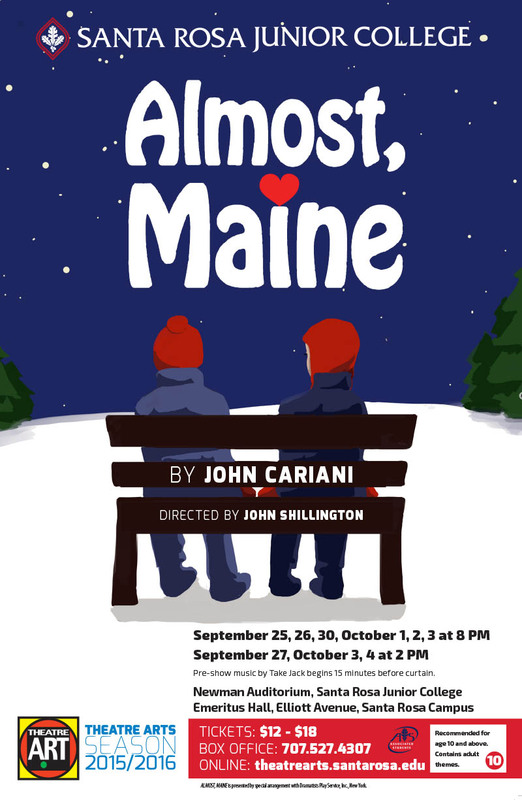 Almost, Maine: It’s love. But not quite. Recommended for age 10 and above. Contains adult themes. This will be a lovely evening filled with poetry and song… a premiere of original compositions and arrangements of bird-related songs including collaborative works with and readings by poets Elizabeth Herron, Terry Ehret, Katherine Hastings, Jodi Hottel, Maya Khosla, Greg Mahrer, Phyllis Meshelum, Larry Robinson, and Mike Tuggle. Additional settings of poetry by Kathleen Lynch. This event is sponsored in part by Prunuske Chatham, and is also supported by Poets & Writers, Inc. through a grant it received from The James Irvine Foundation. Seating is limited. Advance ticket purchase recommended! 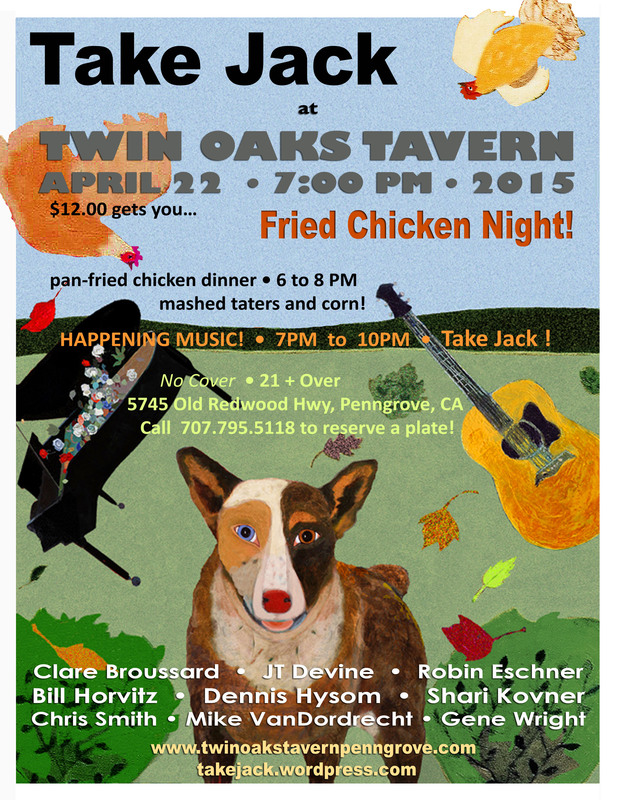 April 22nd at Twin Oaks • FRIED CHICKEN NIGHT! Tickets sell out early so book now! St. John’s Episcopal Church, 40 Fifth Street, Petaluma, CA. Take Jack will perform a 30-minute set during the Kickoff Reception for • St. John’s Big Night Out • A fantastic evening of great food, outstanding wine, live music, unique auction items, a fun raffle . . . Join members and friends of St. John’s Episcopal Church in historic downtown Petaluma for a fundraising benefit to restore and preserve the landmark church designed by architect Ernest Coxhead. A portion of the proceeds will go to COTS’ Food Box Program that provides weekly meals to individuals and families who are at risk of becoming homeless. This catered event features a wine and hors d’oeuvres kickoff party with live music by Take Jack, a fabulous live & silent auction and a raffle, all at St. John’s Norman Cram Parish Hall, followed by a gourmet themed dinner at a private Petaluma home. ~ For reservations and additional information, go here! Stephen Dunn Pulitzer Prize winning poet comes to Sacramento. Mr. Dunn will read from his new collection Lines of Defense: Poems. 2 settings of poems by Kathleen Dunn, and a premier of 2 new works. Take Jack will be performing in Petaluma as part of this inspired event that will benefit two great local causes . . .
COTS’ (Committee on the Shelterless) Food Box Program, an award-winning Petaluma charity that provides food and shelter to the homeless. Called St. John’s Big Night Out, this catered event will feature a wine and hors d’oeuvres kickoff party with a fabulous live & silent auction, and a raffle, all at St. John’s Norman Cram Parish Hall, followed by a gourmet themed dinner at a private Petaluma home. 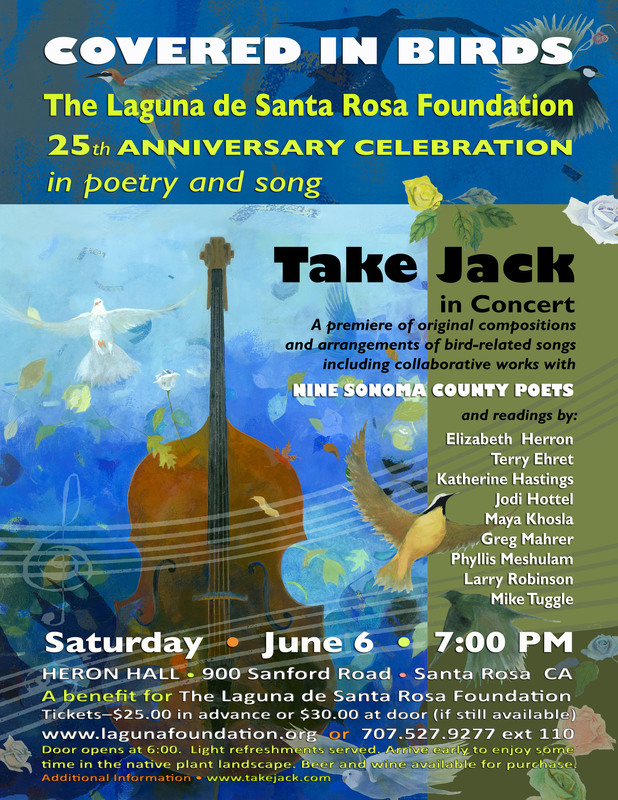 The Jacks will be performing a collection of songs that include new compositions and favorites from their repertoire that slant toward winter, along with 2 of their original settings of poems written by Sacramento poet Kathleen Lynch and a piece by New York composer Neil Rolnick. Reservations are first come, first served. Parking is available in the neighborhood, or you can enter Golden Gate Park at 25th Avenue and park there. Take Jack will be performing new arrangements and compositions for the pre-show and prologue to DISTRACTED at the Santa Rosa Junior College beginning in the lobby 25 minutes prior to curtain.